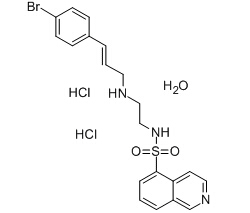 Rp-8-bromo-Cyclic AMPS (Rp-8-bromo-cAMPS) is a cell-permeable cAMP analog that combines an exocyclic sulfur substitution in the equatorial position of the cyclophosphate ring with a bromine substitution in the adenine base of cAMP. Bucladesine calcium salt(DC2797 calcium salt) is a membrane permeable selective activator of PKA. 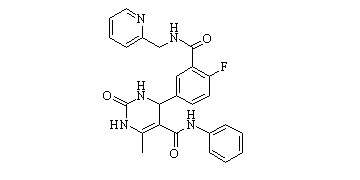 CCG215022 is a potent GRK2 and GRK5 inhibitor. CCG215022 exhibited nanomolar IC50 values against both GRK2 and GRK5 and good selectivity against other closely related kinases such as GRK1 and PKA. AT7867 is a potent ATP-competitive inhibitor of Akt1/2/3 and p70S6K/PKA with IC50 of 32 nM/17 nM/47 nM and 85 nM/20 nM, respectively; little activity outside the AGC kinase family. H 89 2HCl is a potent PKA inhibitor with Ki of 48 nM, 10-fold selective for PKA than PKG, greater than 500-fold selectivity than PKC, MLCK, calmodulin kinase II and casein kinase I/II. H-89 (dihydrochloride) is a potent inhibitor of cyclic AMP-dependent protein kinase (protein kinase A) with IC50 of 48 nM and has weak inhibition on PKG, PKC, Casein Kinase, and others kinases.